Three documentaries offer moving and intimate portraits of the rural poor. 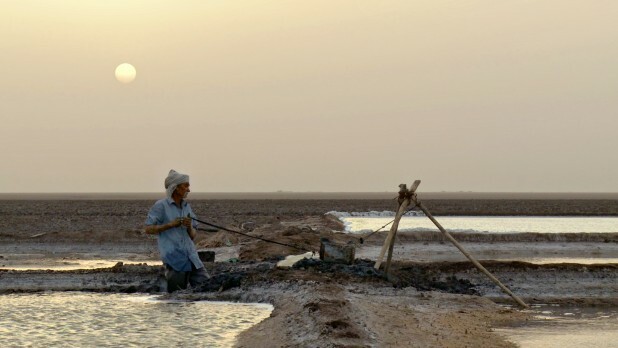 In the documentary My Name is Salt (directed by Farida Pacha), set in the saline desert of Little Rann of Kutch in India, a sequence shows the middle-aged protagonist fretting over the quality of salt crystals forming in his fields. “Leave it to the sun”, advises a fellow farmer stoically. This quality of chance and the never ending toil that accompanies the life of the rural poor formed the canvas for three documentaries that were screened at Film Southasia’ 2015. Farida Pacha’s My Name is Salt in contrast, moves almost wordlessly, creating vivid tableaus from the life of a family of migrant workers, labouring for eight months in the Little Rann of Kutch. Their harvest is salt, and the film begins with the arrival of a pump that will supply the brackish water which will yield the salt crystals. The film moves from long shots of the baking desert, the heat rising in vapours, to intimate mid shot of Sanabhai and his family as they tend to their salt fields. In a beautifully choreographed sequence, the family moves in a bizarre dance, treading the salt with their bare feet, crossing the camera one after the other. It is a joyless dance, one of difficult postures and no ease in movements. Yet the very next sequence shows Sanabhai’s young daughter dancing with carefree abandon to music as she plays on the salt field. Pacha imbues the bareness of the terrain with the incessant industry of the family. The emptiness of nights where nothing happens is punctuated by days with no rest. Humans work as hard and with greater efficiency than machines, as the pump requires constant tending and repairs. Again, as in Drawing the Tiger, women form an active part of this landscape of labour. Sanabhai’s older daughter wrestles with the mud to form the bunds for their fields, and sets the pump running with her mother Devuben when needed. The thud-thudding of this machine forms the soundtrack for much of the film. Mobile phones provide entertainment for children here too, but they communicate with winking mirrors across the desert. Pacha’s protagonists are not joyless – the family goes to the market and enjoys the rides and the shops. But they return to the unforgiving glare of the salt fields, and once their harvest of crystals is gathered, they pack up their possessions in sacks and move on. The fragility of their existence and the ecosystems that support them is beautifully and heartbreakingly brought home in Pacha’s closing sequence, when the desert is show to be transformed into a sea during the monsoons. The salt pans are washed away, the boats lying on the parched earth sail through the waters. Yet the next year, the film tells us, Sanabhai and his family will join 40,000 other families who will return to till their fields of salt. Together, the three films from the swathe that makes Southasia are a potent reminder of the beauty and intense loneliness of manual labour, Pacha’s film in particular frames the hands and feet of Sanabhai and his family like sculptures, caked with stubborn mud, muscles taut and tense against the elements. They also act as antidotes against romanticising rural life, by demonstrating how families live on the edge, always hungry, never entirely secure, subject to vagaries of nature and markets alike. With Southasia rapidly urbanising, the films are a reminder of the brutality and fragility that defines the lives of the rural poor, from the Himalayan villages of Nepal to the salt fields of India.